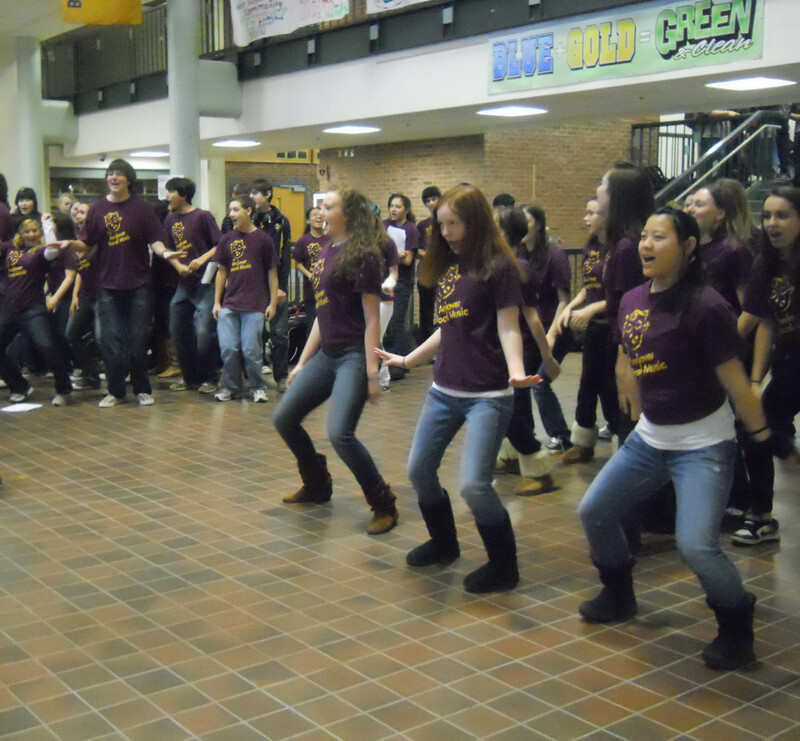 AHS choir members perform in the foyer. Photo by Brynn Stevens. On the morning of Thursday, Dec. 15, music director Mr. Mercer had a surprise announcement for the AHS Concert Choir and Show Choirs that he later shared with the entire school: the choirs’ video submission to a contest sponsored by the Fox network and the hit television show Glee had won a first-prize award of $25,000! Freshman Alex Hanscom filmed and edited the video for the Glee Give-a-Note Contest, and students from various school choirs acted in it. The contest distributed a total of $1 million among 73 worthy schools. There were three $50,000 grand prize winners, 10 $25,000 first prize winners, and 60 $10,000 second prize winners. The AHS video made it through the first round of competition thanks to active support by the student body and community. After submission, the video was viewable online and students and others were asked to vote for it in order to move it along to the next round. “We got as many people as we knew to vote and we all voted everyday,” said senior Summer LeCain, president of the JV show choir. Once the videos made it to the second round, judges determined the distribution of prizes. Congratulations to the Andover Vocal Music Association! ‘Tis better to give or receive? On Thursday, Dec. 15, and Friday, Dec. 16, AHS students walking through the foyer were treated to an early-morning performance of holiday songs by the AHS Concert Choir and Show Choirs. The school choirs performed holiday classics such as “Rudolph the Red-Nosed Reindeer” and “Frosty the Snowman” to benefit Cor Unum, an organization that provides families in need with meals. According to senior Summer LeCain, president of the JV show choir, the morning concerts raised $307 for Cor Unum. Choir members enjoyed the opportunity to sing in front of their classmates while also supporting a worthy cause. “We all love performing, and it’s great to get to perform in front of many of our classmates who don’t usually hear us,” said sophomore Julia Ganley.